An anonymous poll of 33 NHL players taken at the Player Media Tour this month in Chicago revealed that players believe the Buffalo Sabres and Arizona Coyotes will duplicate last season’s incredible turnarounds of the New Jersey Devils and Colorado Avalanche. Like the Devils and Avs, the Sabres and Coyotes each finished dead last in their respective conferences last season. Last season was the first time in NHL history the last-place team in both conferences rebounded to make the playoffs the following year. Players were granted anonymity, and asked not to select their own team, in order to generate an honest answer. There were a few surprise answers, such as the New York Islanders, Columbus Blue Jackets and Anaheim Ducks. Some chose the Florida Panthers as a surprise team, just as Aleksander Barkov was a popular pick for most underrated player. It’s hard to call a 96-point team – and their newly minted captain, one of the best all-around players for a while now – a surprise, though. The Cats won’t be sneaking up on anyone. Nonetheless, it’s hard to ignore the youth movement underway in Western New York. The Sabres, who haven’t made the playoffs since 2011, were the pick of nearly half the 33 players. Their pain turned into good fortune by drafting smooth-skating Rasmus Dahlin at No. 1 overall. Rising star Casey Mittelstadt is expected to step into a big role while Alex Nylander also hopes to make the leap to the league. Many are wondering how the Sabres will cope after moving Ryan O’Reilly to St. Louis, but some believe that the return, including Patrik Berglund and Vladimir Sobotka went, unnoticed. The Coyotes didn’t make nearly as many moves. The big one was swapping Max Domi for Alex Galchenyuk, who is expected to slot in at centre, and signing speedy winger Michael Grabner. The bet is that their seven players on entry-level contracts this season, including Clayton Keller, Dylan Strome, Christian Dvorak and Christian Fischer, will take the next step while Antti Raanta remains healthy in net. Raanta quietly collected a .930 save percentage in 47 appearances last season. Arizona needs a 25 or 27-point improvement to be in range for a playoff spot. Buffalo might be looking at even more, considering 96 points wasn’t enough for the Panthers to get in last year. But one Eastern Conference veteran who is no stranger to hardware predicted the Sabres will be the best team in the NHL in five seasons. That’s a bold statement for a team that has averaged just 65 points a season over each of the last five full campaigns. Buffalo also signed netminder Carter Hutton and acquired Conor Sheary and Matt Hunwick from Pittsburgh. 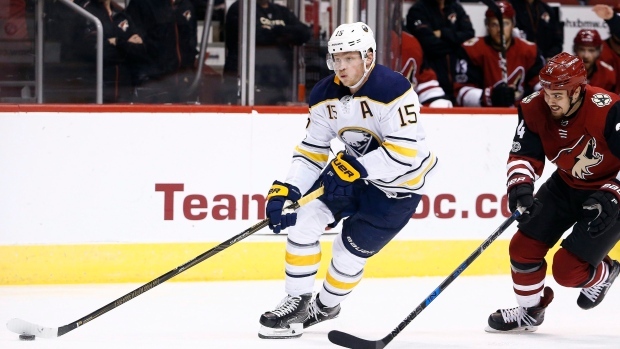 Eichel, 21, said he learned “a lot” about himself – and losing – last season. He is entering the first year of an eight-year, $80 million deal. Eichel has 73 goals and 177 points in 209 career games, but feels like he hasn’t made a dent yet. He has also missed 36 games over the past two seasons with injuries. So, how do the Sabres break into the Big Three in the Atlantic – Tampa Bay, Boston and Toronto – with the Panthers nipping at their heels?